Throughout time, poets, philosophers and psychologists have generally agreed that there are really only two emotions -- love and fear -- and everything else stems from these. Love is what we are born with, the sheer joy available in this present moment when we are open and receptive to the world. Fear, on the other hand, is an illusion. Fear only exists within the confines of the past- memories of how things went and the meanings we made of them -- and the future -- where our worries congregate around what "could" happen. "There are only two feelings, love and fear. There are only two languages, love and fear. There are only two activities, love and fear. 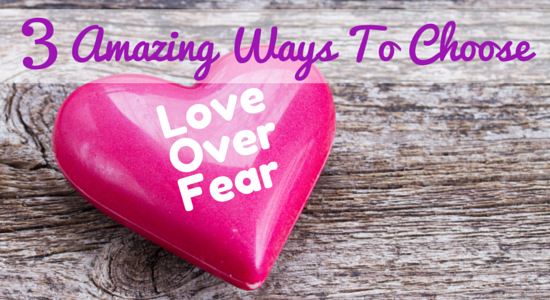 There are only two motives, love and fear. Two procedures, two frameworks, two results; love and fear, love and fear." So what is fear? Fear is contraction -- a pulling away, closing off and perpetual comparison. Fear cannot exist without comparison. Love, on the other hand, is expansive -- opening up, creating endless possibilities and unconditional to surrounding circumstances. It is vulnerability at its finest, knowing that no matter what happens, we are living life to its fullest. 1. Breathe -- fear is without breath. When we can use our physiology to expand our capacity for breath, we invite love into our bodies. We introduce expansion into our vocabulary, allowing ourselves to see the growth and possibility in each situation. 2. Experience and enjoy the present moment -- because fear lives in the past (memories) and future (worries), the more we can stay present in our bodies and what is going on around us, the more we are open to life's unfolding as it actually is -- whatever that may be. 3. When in doubt, trust your body -- when you find yourself at a crossroads where a decision needs to be made, instead of weighing pro's and cons or debating merits, trust your body. Listen and attune to your physiological response to know where you experience the greatest expansion. Sometimes the answer may surprise you, but it is important to remember that we can't possibly be aware of all the possible answers to any one of our quandaries -- what may seem solid and dependable may not be so and it is amazing what your body knows and communicates that your mind cannot comprehend. Follow the expansion. Above all, it is important to remember that love is our natural state. As Marianne Williamson states "Love is what we were born with. Fear is what we learned here." The only meaning in any challenge or obstacle is the meaning we prescribe to it, and we have choice in these moments to declare what that meaning is for us. Re-attuning to love is not so much about ignoring or denying fear as it is about peeling back the layers, releasing the armor and allowing a pure fullness of experience. Young kids live love -- present to whatever is, embracing life in all its messy glory. We could all stand to learn a lesson from that.